This past Christmas was somewhat unconventional for us. This year, we ordered take-out from our favorite Indian restaurant. Crazy, I know, but we are gypsy rockstars and do like a little crazy. I wore a beautiful tunic that my dear friend Pragna had given me. She is my connection to everything Indian. We set the table with a few Eastern accents including a couple of cute karahi bowls. It was such a refreshing change. The food was fabulous. Everyone really enjoyed the crisp samosas stuffed with peas, potatoes and cumin seeds, saucy curries and fragrant vegetable biryani rice. The only thing missing were those luscious little globes of sweetness called Gulab Jamuns. I just love them. They are basically Indian donuts soaked in syrup flavored with saffron, cardamom and rose water. How we forgot to order them is a mystery. I don’t even remember what we had for dessert. I should have my head checked. Saturday afternoon, I was working on a French country stew when I got a call from my cousin, asking if he and his Mrs could drop by for an impromptu visit. Delighted at first, my sentiments shortly escalated to something of a state of panic when I realized there was nothing in the house to present to my guests. No cake, no cookies, no ice cream, not even time to dash to the bakery. No self-respecting Armenian woman is ever so ill-prepared to entertain. After chasing my tail a bit, I realized I could probably whip up a batch of those gulab jamuns I missed from Christmas Eve. When our guests arrived, my cousin said that his wife suggested they stop at a bakery on their way, but he declared it sacrilege to bring baked goods to my house. Fortunately, despite my haste, the gulab jamuns turned out beautifully. “Coco jan, how did you get them so perfectly round?” It really wasn’t me, at all. It was simply the magic of baking soda and hot oil. Gulab means rose in Hindi, alluding to the rosewater in the syrup. Jamun refers to a dark purple berry native to India. 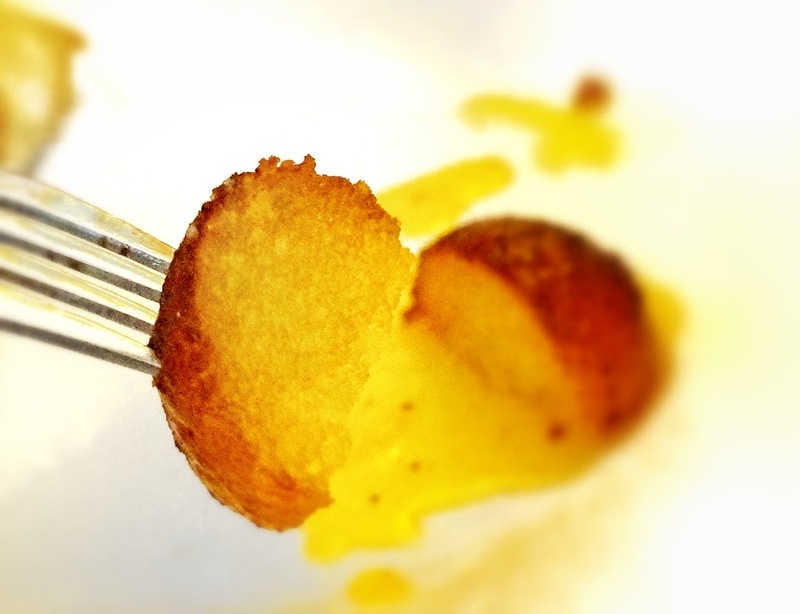 These little spongy globes of dough about the size of golf balls are lightly fried in vegetable oil, then soaked in a syrup. The syrup can simply be just sugar dissolved in a bit of water or flavored with any combination of cinnamon, cardamom, cloves, saffron, rose water, orange blossom water and even coconut extract. Normal people order exotic things made by native people and just enjoy them. Crazy people like me want to learn to make them at home. And I did, which means so can you. The ingredients list is short and very basic ingredients, nothing fancy. Persian Basket has liquid saffron and rosewater if you to infuse the syrup with traditional flavors. You may just have to run to the store for the milk powder. Look for it in the baking aisle on the bottom shelf, below the cans of sweetened condensed milk. Use a deep nonstick pot to prevent the dough from sticking to the bottom. 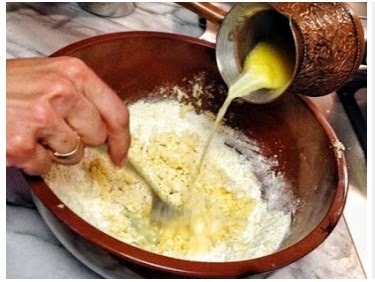 Make sure the oil is warmed slowly and bubbles gently when the dough is added so the dumplings cook evenly to the center. Follow this simple recipe and you are sure to make headlines. These exotic little gems will have everyone, even last-minute guests wondering if you have any Indian heritage in your bloodline. CAUTION: Keep little hands and furry friends at a safe distance. Use a mortar + pestle to grind saffron threads with a big of sugar. Add to a pot along with the rest of the sugar, water and cardamom pods. Stir to dissolve sugar and place over medium heat. Cook for 10 minutes or so. Remove from heat and set aside to cool. The syrup will thicken when cooled. Fill a deep, nonstick pot with about 2 inches of oil. Place on the back burner over low, low heat. Use a small saucepan to heat butter and milk just until butter has melted. Remove from heat, gently swirl to combine and set aside. Remove your rings and give your hands a good washing. Combine dry milk powder, flour, baking soda and salt in a big bowl. Slowly drizzle milk + butter mixture until dough forms. Add vinegar and knead until dough comes together. Drop a bit of dough into the oil to test the temperature. If the dough rises to the top and the edges start to bubble, you’re ready. Gently roll it into a ball between the palms of your hands. Set it over the spider or spatula and carefully lower into the hot oil. Fry for a couple minutes until the ball just turns golden brown all around. Do not overcrowd the pot as the temp of the oil will drop too much. You can easily fry 5-6 balls at once. Turn them occasionally to be sure they cook evenly. Put into syrup while still hot and let them soak for a spell. Store in syrup in an covered container for up to 3 days. I have a terrible character flaw when it comes to baking There is a fundamental difference between cooking and baking. A savory recipe is really just a suggestion, but one for something sweet must be followed in detail. I have a problem obeying instructions, which isn’t a problem when I’m cooking. In baking, it could spell disaster. This morning, I woke up early to make these luscious little gulab jamuns for my friends at the office. There was a bag of coconut flour in the pantry and I was curious how it would do as a substitute for regular flour. Feeling quite proud of my genius idea, I got right to work, without a drop of coffee in my blood. Unfortunately, the balls of dough fell apart in the oil. So, my little experiment proved me wrong. That is when I was convinced I should follow my own recipe. Someone recently said that the price of eggs has gone up. I could not tell you the price of a dozen to save my hide, because I only care that they are free-range. Eggs are deemed a necessity, like gasoline, water and flour. Yes, flour is also a necessity, at least in my kitchen. 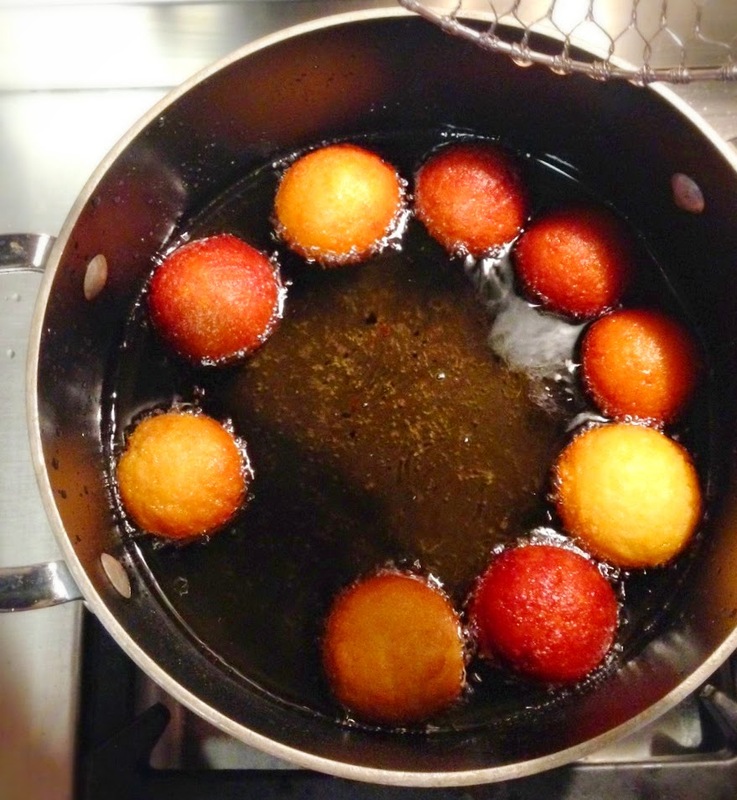 Luckily, this recipe for gulab jamuns does not require eggs. Not only does it save money, but also calories, making it the perfect post-Christmas treat. Actually, this isn't like frying bacon. It's a very gentle boil. If you use a deep pot and run the vent overhead, you'll be fine. I'm not a fan of greasy messes, either! Now it is my turn to lick my computer screen! Wow, looks so delicious and the recipe seems like something I could attempt. Where do I get rose water? Have a wonderful weekend, my sweet friend. 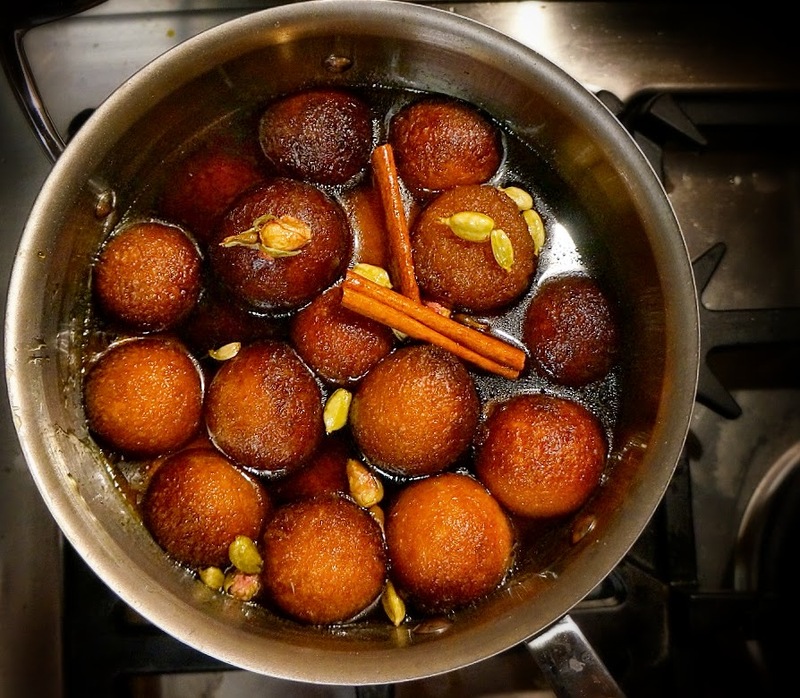 My dear Colette, I never had Gulab Jamuns in my life and I never even heard of them either but they sound like bliss on a dessert plate: and the way you describe them and the way they turned out so perfectly, your guests must have been utterly delighted! Many hugs – hope all is well in your part of the world! Indians have amazing food. I do hope you try my recipe, G.
You're so cute! persianbasket.com has rose water and everything else you need. Hi, Andrea hon. So glad you've been introduced to something new. I do hope you try making these. They are so easy and delicious. I know you'll love them. Sorry your apron is so late. I'm waiting for the screenprinting and will work on a custom logo for you soon. I was reading this post with a heart full of love and joy and a lip which had widened into a glowing smile. 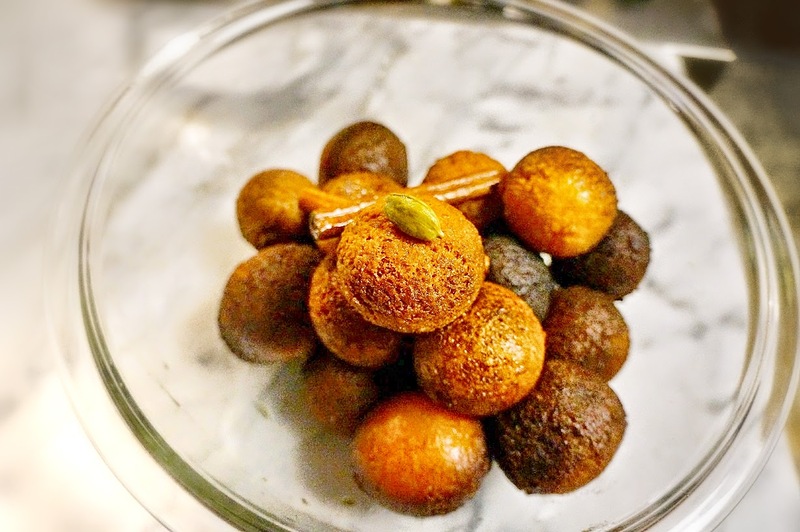 As an Indian who has grown up eating these sweet liquid filled spheres of yumminess, I vouch that these are one of the most perfect Gulab Jamuns that I have ever laid my eyes on. I am delighted to know that your Christmas celebrations had an INDIAN tinge to it. I am truly happy that you decided to make Gulab jamuns for your impromptu guests when you could have made something else. All these and much much more makes me want to send you a bear hug. 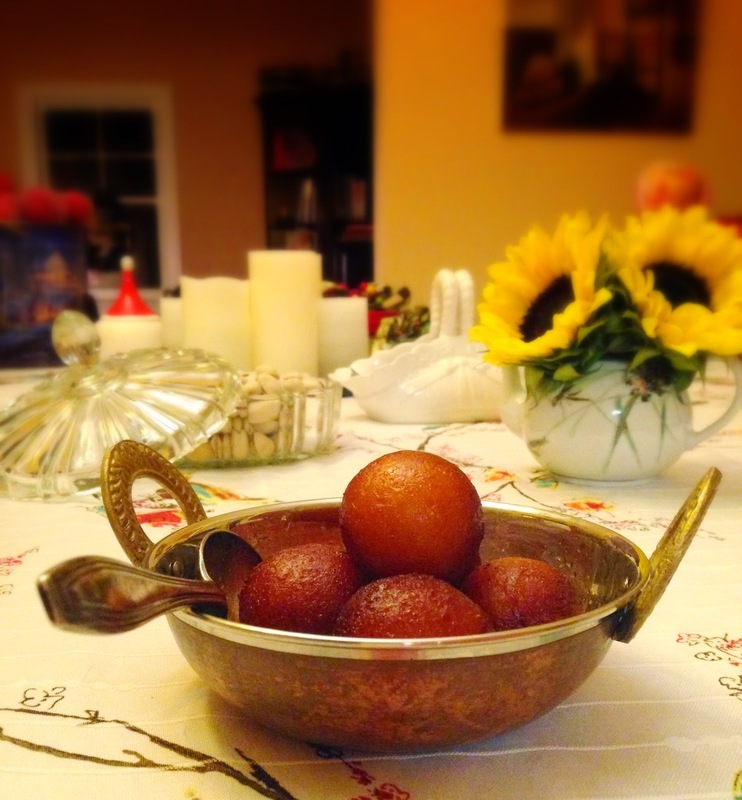 A beautiful post with gorgeous looking delectable Gulab Jamuns.